I am going to hopefully finish this post by instalments as it is a deep subject. Easy money as I got four hours sleep before being awoken by this girl screaming 'her head off' peering through the bars. The even was organised by a magician and his group. The evening started off about lectures on ghosts with a certain amount of drama which seemed to stimulate audience interest. I was taken back, by a Victorian Spirit Bell that Damion (the magician was using to communicate with spirits). His mother spent about thirty minutes discussing with me, how Damien happened to come across the bell after a house clearance. It was strange to discover that the bell would activate by itself when Damion summoned a spirit. The rest of the crowd were ecstatic! Strangely enough, I was suspicious and my research led me to Ebay where I found the identical spirit bell being advertised for $400 with remote control!!!!! We later had a great big argument with him and his staff, as I do not like being fooled. I was told that the problem lay with me, because Damion never said that he was a psychic and that the event was meant to a trick show. Pretty good, I spend years as a researcher and build up trust with people and he comes along to make easy money from their imagination and so called gullibility. I felt better after being told that it would normally have cost us altogether $160 for admission and that we got in free! . The thing that got me, was that folks like to see things moving. A door bell ringing although genuine as ghost activity would elude people into misconception. 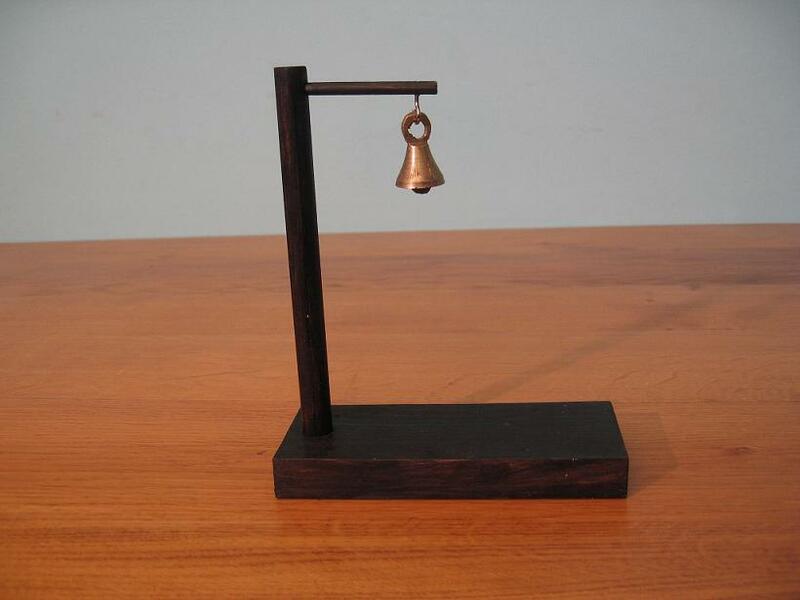 I certainly could not find a genuine spirit bell but had always wanted to make one! My mother who is over 92 years old is unstable on her feet and the care team had fitted Noght Lights that would activate with the wave of a hand in darkness in case a bulb blew or that there was a power failure. It all started one evening when my mum was in bed upstairs and I sat in the living room with the night light on the wall. I thought about my life and other concerns that I had at the time, with near tears in my eyes as I sat in the darkness. I asked for guidance and then the night light just turned on, whilst I was stationary. Of course you think of all kinds of things, like a faulty device or slight movement of my hands or the turning of my head and so on. It became apparent after spending many nights in this location that the light would come on with intelligence. For example, I would be watching the film AI on TV and the bit would come on, where David cuts his mother's hair whilst she is sleeping and a split second later I would hold the scissors in exactly in the same position cutting mu own hair as both the image and myself would be frozen like for like. As an engineer, I decided to take the night light to bits and cover up the IR detector with black tape and to place it inside the air tight enclosure. Still it worked in the same way! This prompted me to purchase another 10 more of these lights from EBay by which they ALL did the same! I found that not all models were the same, as others would not activate at all! So I then devised a way that the output signal from the LEDs could be led into a relay and a relay booster acting as a transducer could activate a second relay to trigger voltage to a solenoid to activate a bell. I will further demonstrate this later. I have invented a device that can communicate with the spirit world and acts as a 'Yes' ;No' answering device using both red and white LEDs to allow a positive or negative response. I had broke science! As this device will operate about six or seven times in one hour and will go still when I am not there! I also found that spirits can read a film playing about two seconds in front. For example:- Whist watching a film, the device will activate about two seconds before someone comes on and says:- "Hello George!" Verdict of an Electronics Forum:- "Take your @&**@ junk elsewhere and **** ***! I think they could not understand it???? Called me an idiot! Last edited by George; 01/29/2019 02:26 PM. The main component is the circuit board of the Night Light. 1) An LED artificial wax candle enclosed in a Bell Jar housing that is connected to a relay allowing the deed from the battery. 4) A voice circuit that allows a recording to be played once the main board is triggered. 6) Series of toggle switches to allow certain 'off-on' functions. 8) Includes a transformer rated at 12v 4 amps. What Had been Changed On the Night Light Circuit Board? The IR detector had been wrapped round with light proof shielding and placed in a dark small container not allowing it to detect light. 1) Only one manufacturer's device will work 100% with spirit activation. Strange....substitute testing between constants and variables but no answer. It means that without this capacitor, there is not enough PD to activate the IR sensor. This will prove conclusively that the world of spirit exits. Even the experts are unsure? Think about it and electrostatic energy in/with a ghost EMF meter??? The other problem I am having is battery power. The components need to be changed and better transducers allowed. You know why? Because they are idiots and when there is something that they cannot explain, they make me the idiot when I know more than they do. Cos they cannot be open minded enough to look at the device scientifically. They think they know it all and that the world of spirit does not exist, never mind measured. So they use all their brainwashing, cannot answer and say FAULT. They cannot argue that it does it with every single one, apart from different manufacturers. It is by a million to one chance taht I discovered this. The reason why...is because I am open minded. Also electronically trained....and better than they are. Last edited by George; 01/29/2019 11:12 PM. Wow this is outstanding work! Show it at work to us please would you my lord. It is a genius project thanks for your time!